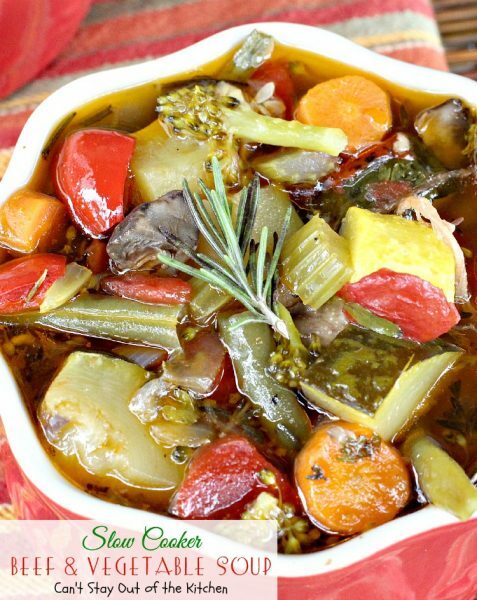 Slow Cooker Beef and Vegetable Soup is a delightful soup recipe any time of the year–not just in the fall or winter. I have to admit I’ve grown to really enjoy soups over the past several years. Soups made with vegetable broth, chowders made with a creamy base, soups with southwestern flavor or Tex-Mex style–I like any and all combinations. Soups, soups, soups! While I make more soups in the fall and winter months, I don’t mind making them all year round. (Even though we have very hot Texas summers here!) Slow Cooker Beef and Vegetable Soup is one of my wonderful soup recipes. It’s healthy, low calorie, gluten free and cooks in the slow cooker making it so convenient for family dinners. I didn’t grow up eating soups, even though my mom did. She said Grandma made a soup that was served before every “supper” and dinner meal back when she was growing up. Because Mom’s family lived on a farm, all of them required a lot of sustenance for their slew of daily chores. Slow Cooker Beef and Vegetable Soup is wonderful comfort food. 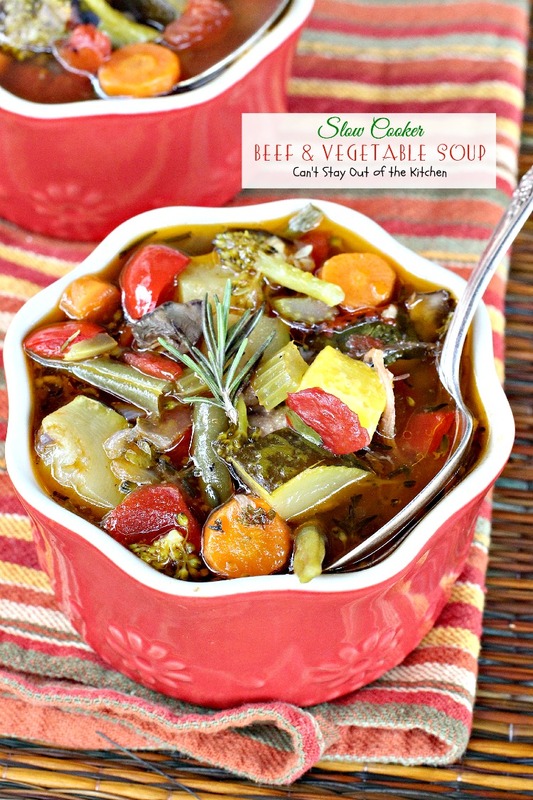 If you’re trying to eat healthy, Slow Cooker Beef and Vegetable Soup is a wonderful option. 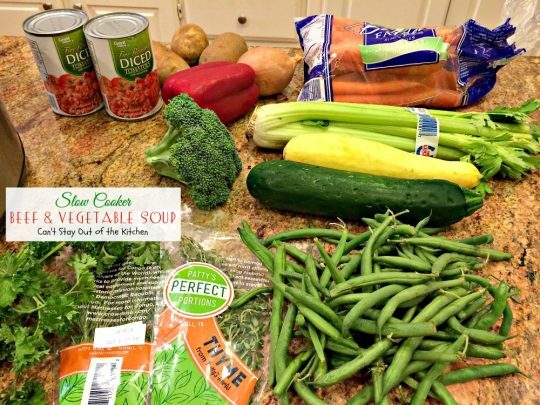 This soup is healthy, low calorie and gluten free. I used these ingredients for the soup, plus 7-8 pounds of beef bones. Place Beef bones in a crockpot. Fill with water and sprinkle generously with salt and pepper. Cook bones on low over night (8-10 hours) or for about 4 hours on high. The beef bones yield only a very small amount of meat but a delicious broth. If you want more meat, add some stew beef or leftover pot roast. Take meat off bones and cut into chunks. Discard bones, fat and gristle–or you can add more water and recook the bones for additional broth. 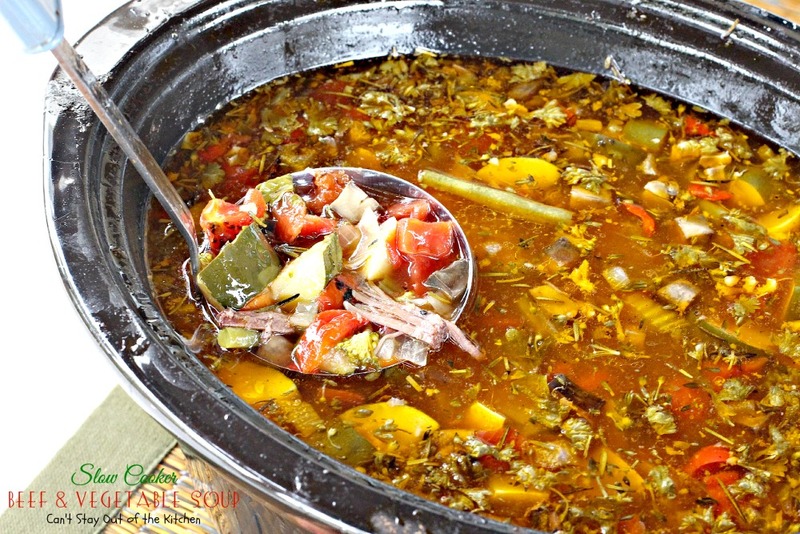 Place meat back into the crockpot with homemade beef broth. Dice onions, celery, slice carrots and peel and cube potatoes. Add to crockpot. 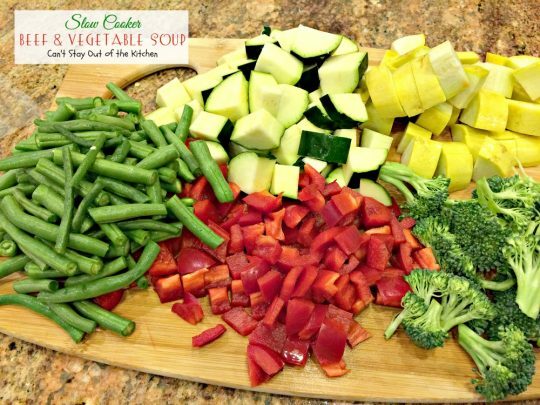 Quarter zucchini and yellow squash, dice red bell pepper, cut broccoli florets from stalk, and cut off tips and ends of green beans, then halve. 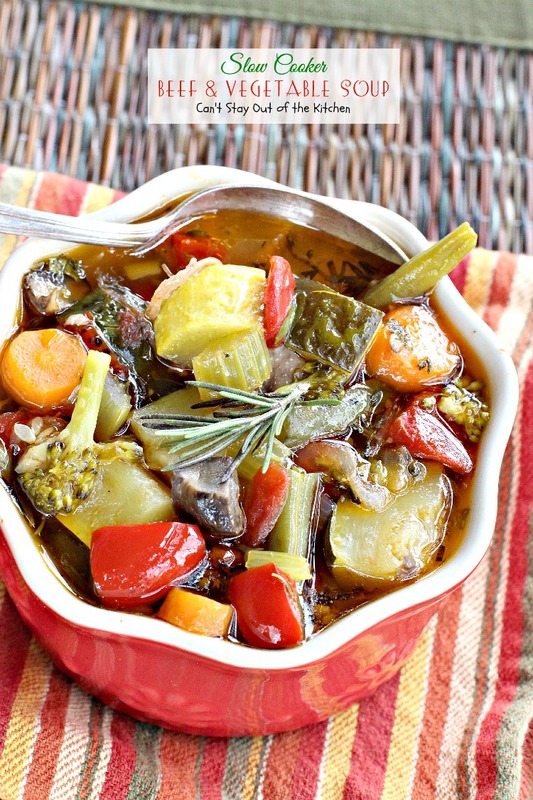 Add veggies to crockpot. Add chopped mushrooms, fire-roasted diced tomatoes (undrained), parsley, salt, pepper, thyme and rosemary. Cover with lid and cook on low for 4-6 hours or until veggies are tender. 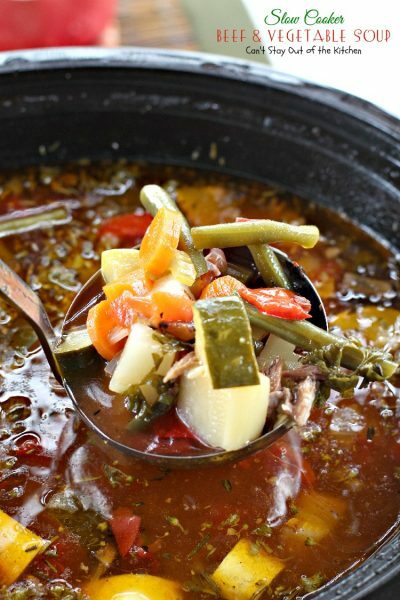 Serve Slow Cooker Beef and Vegetable Soup with your favorite homemade bread or biscuits. 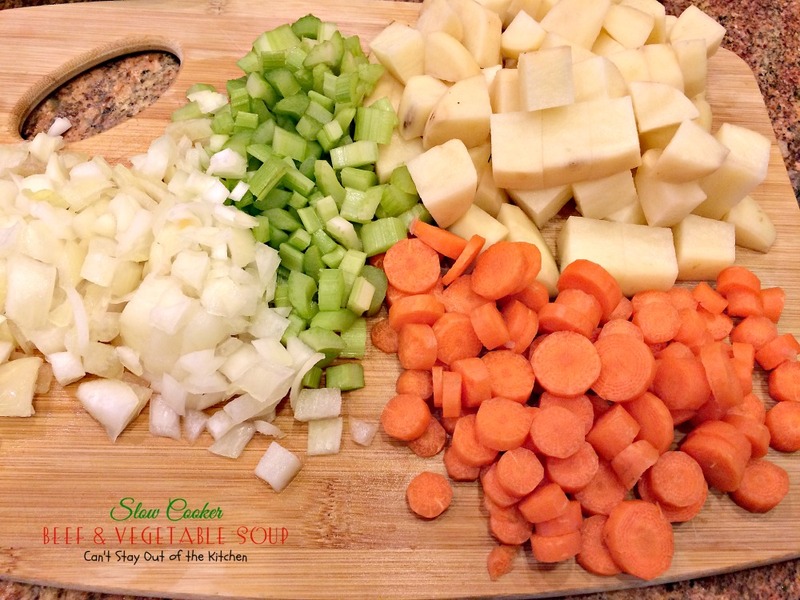 I loved all the veggies in this soup. 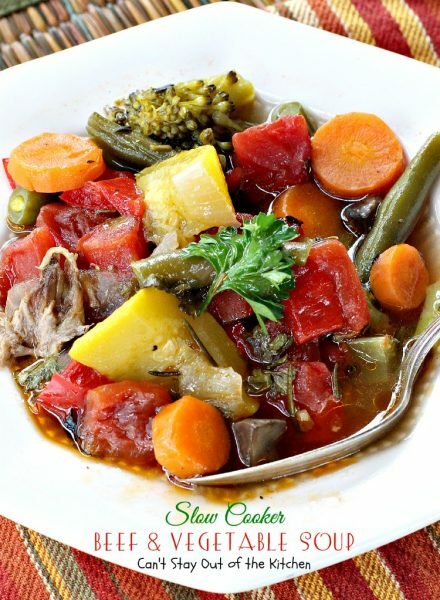 This wonderful soup is healthy, low calorie, gluten free and made easily because you just toss everything into the slow cooker. Great comfort food. 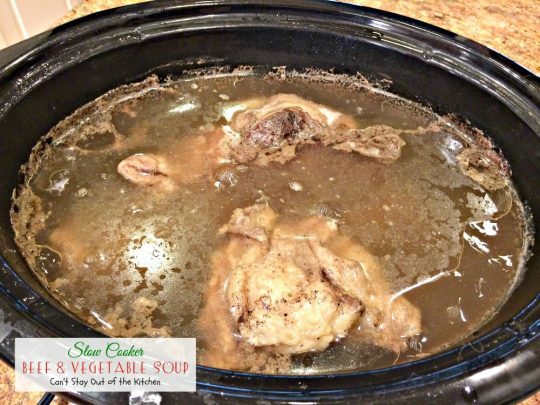 Place soup bones in a large crockpot and fill with water. Sprinkle heavily with salt and pepper. Cook overnight on low – about 8-10 hours. Remove bones from broth and discard fat, gristle and bones. Add beef back into the homemade beef stock. Add all the veggies and seasonings. 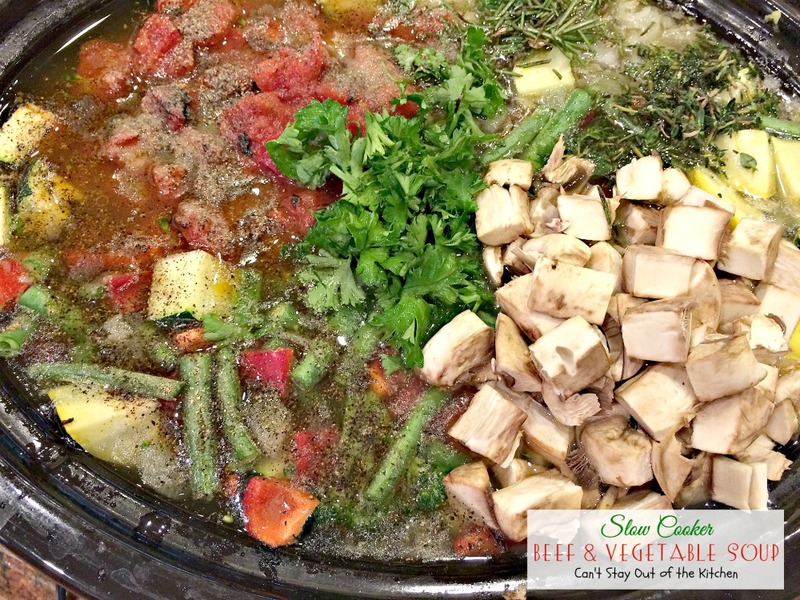 Cover crockpot with lid and cook on low another 4-6 hours or until veggies are cooked through. NOTE: You can also recook the bones and fat in water in a crockpot a second time to render more homemade beef broth. 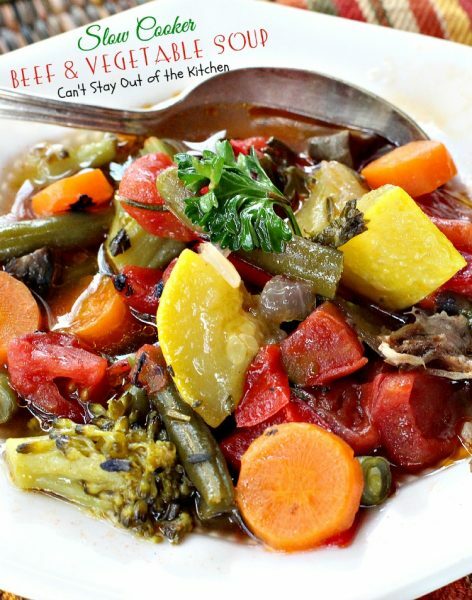 NOTE: If you desire more meat you can add stew beef or leftover beef from a pot roast. 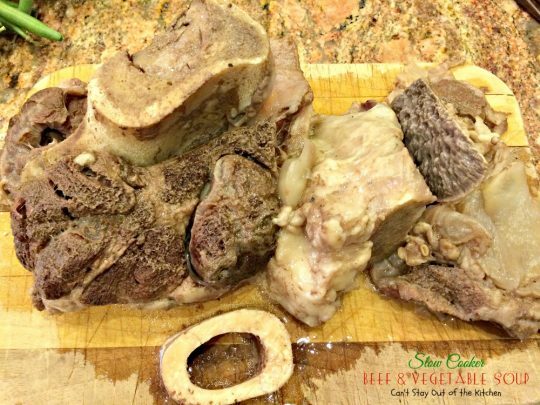 You can also recook the bones and fat in water in a crockpot a second time to render more homemade beef broth. 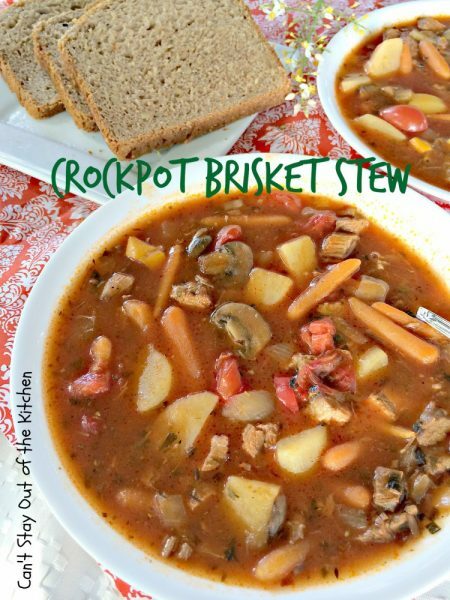 [br][br]If you desire more meat you can add stew beef or leftover beef from a pot roast. Garnish your soup with fresh thyme or rosemary. This hearty soup is so satisfying, you’ll enjoy every drop! Thanks so much Kim. It really did turn out very tasty. Plus I loved being able to throw everything into the crockpot! Teresa, this looks so incredibly yummy. Thank you got posting this! I love how you made broth first with the bones…makes it so much more nutritious and tasty. Idk if you’ve seen this or not, but the sources I learned from on broth making suggest adding (raw )apple cider vinegar in the broth making stage, which helps draw out the minerals from the bones… it’s not a lot, so it doesn’t effect the taste negatively at all…in fact, I think it makes it tastier, and my understanding about minerals is, that they are huge contributors to taste. Great idea, Linda. I’ll try that the next time I cook down the bones.